Beautiful Two Bedroom Plus Den in Ideal Rancho Las Palmas Location - Walk to The River!! Escape the winter blues in this Beautifully Furnished 2BR 2BA + Den. Enjoy all the designer touches throughout. You'll find it hard not to enjoy every moment in this spectacularly appointed Condo! From the well equipped Kitchen, Four Flat screen TV's. Step-in Garden Tub in Master Bathroom & Unique Tiled Archway of Guest Walk-in Shower. When you get tired of the beauty with-in, step out to Spectacular Northern Views. Whether Sunshine & Mountains or Moonlight & Stars you won't find a more gorgeous sight. Come Stay with us and see what you have been missing. Wireless connection is offered as well as free local and long distance U.S. and Canada calling. Owner is Dog Friendly, please inquire about pet policies prior to reserving this home. Wireless connection is offered as well as free local and long distance U.S. and Canada calling. We couldn't have picked a better place to stay. It had everything we needed and more, for our Thanksgiving family vacation. Vacation rentals communication was perfectly on point and so appreciated. The big couch in the living room and the side chairs were a great place for our family to hang out, as was the nice patio furniture outside on the patio. An update the master bath would be nice. 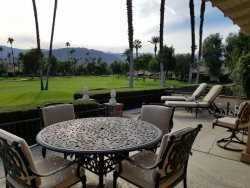 Great location in Rancho Las Palmas. Clean. Nice layout with nice tv's and outdoor patio table. 2 car garage. Kitchen well stocked with dishes etc. Laundry room with washer and dryer. Comfortable beds and linens. Great condo in Rancho Las Palmas. Visited during 4th of July weekend. I've stayed in this complex several times renting different condos and this one is as great as the others. Awesome location right on the fairway and short walk to community pool. Condo was nice and well kept. Great communication w/the property managers prior to arriving. Plenty of room and living area in back patio overlooking the golf course. Grocery stores and restaurants very close. Would stay here again. Our stay in Mar65 was amazing. The location is superb as it is only a short walk to the River. We loved our stay in Palm Springs and hope to return next year. special thanks to Kathy for arranging it all. Great vacation- great unit- everything in great order. See you next year (God willing). Merry Christmas everybody!!!!! No Music Festival Guests. Special Event bookings require a $1,000 security deposit.